Strong vine with excellent cover. 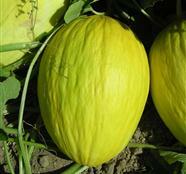 The oval-shaped fruits, 3-4 Kg in weight, have a slightly wrinkled skin. Golden yellow rind, with a pale ivory-green flesh, and an inviting aromatic taste. Sunshine F1 is characterised by its ability to withstand drought periods, without compromising neither the yield nor the fruit uniformity.